Side effects include: drowsiness, apathy, and blurred vision... I'm taking two. 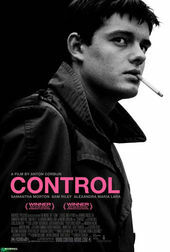 This is my voice...I am the director/producer of Control...this opening scene...of Ian Curtis...was a thought we had in the editing process...to have something of the end at the beginning...to see where he ends up and set the tone. The titles...reflect the epilepsy attacks...it's a very beautiful way to bring that into the title.